Viking’s new launch sets the highest standards – and it’s all done in unique Scandinavian style. After ten minutes roasting in the sauna, the ice-cold water shocks me to the core. But Nordic bathing is not for sissies, and I command my trembling legs to propel me back into the steam room for round two. Sounds a bit extreme, doesn’t it, especially for a cruise holiday? Surely I should be lolling on a lounger, guzzling my umpteenth pina colada of the day. But then Viking Cruises is no ordinary cruise line. In its unobtrusive Scandinavian way, it’s been busy ripping up the rule book. While its competitors load every new ship with fresh gimmicks and technological innovations, Viking is building a fleet of near-identical ships, each one a welcoming haven where the simple pleasures of reading a book in a comfy enclave, savouring a perfect steak or relaxing in the sauna can be enjoyed with no distractions. As two regular guests delight in telling me, there’s no hard sell, and no photographer waiting to take your picture at every turn. And no children – this is grown-up cruising at its best. Viking Sky is the third of the fleet to launch, with three more on the order books, and the Nordic recipe is already proving a hit – not least because of that unique spa experience. On this particular day, Viking Sky is docked in Civitavecchia, and with most of its 930 guests enjoying an excursion to Rome, I’m confident I’ll have the spa almost to myself. But I start the day with a lie-in, letting the ship decant its camera-toting tourists before I leave the comfort of my cabin (my sister’s reaction when I text her a picture: “Is that your room on the boat?? It’s huge!!”). I’ve missed à la carte breakfast in The Restaurant, and the buffet in World Café (fit for a hungry Viking warrior). But there is a third option for sleepyheads like me, and I’m relieved to find that I’m not the only one making use of it. Late risers’ breakfast is served in the panoramic, two-deck Explorers’ Lounge. There’s a cafe bar here, with a Norwegian deli menu inspired by the healthy, home-cooked recipes of the Hagen family. Karine, daughter of Viking’s founder and chairman, Torstein Hagen, named the venue “Mamsen’s”, as a tribute to her beloved grandmother, filling the menu with hearty soups and open sandwiches, just like grandma used to make. The fare is so tempting that it presents me with dilemma: if I’m really taking this spa day seriously, perhaps I should go for herring instead of waffles. Ah, but you can scoff your waffles with a large serving of health-giving berries on the side. Job done – although the waffles also come with a few curls of Norwegian brown goat’s cheese. It’s an acquired taste, so they tell me. The waitress keeps my coffee topped up as I let my breakfast settle, admiring the Explorers’ Lounge decor of astronomical maps, antique globes and sofas adorned with fur throws. Then I hit the gym for an hour of running, cycling, puffing and stretching, in the vain hope that I can fool the genuine gym bunnies into believing I’m one of them. Deciding I can’t, I take refuge in the steam room. 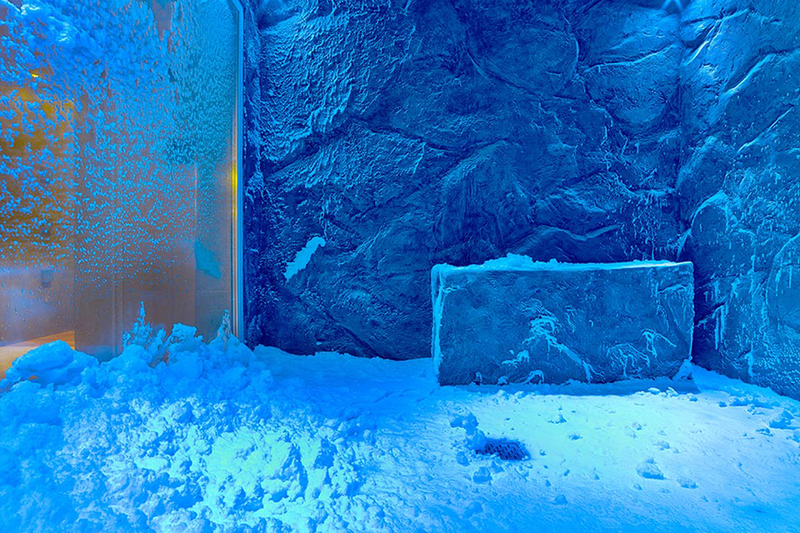 To complete the Nordic bathing experience here, you can drench yourself with an ice bucket, or enter the snow grotto and rub snow over your body. Later, when I’m horizontal on the table, ready for a Swedish Detox Massage, I tell the therapist about my morning in the gym, followed by Nordic bathing and a session in the Jacuzzi. I hesitate before admitting that my preparation also involved a burger and fries at the Pool Grill. But once the treatment gets underway, I wonder if she’s really prepared to be so forgiving. The 80-minute session starts with body-brushing, which I can best describe as a light sandpapering. Next it’s the massage. At first this is firm but therapeutic, but soon my eyes begin to water. Lying face down, I can’t see what she’s doing, but it feels like she’s gripping folds of flesh between her thumb and forefinger, and dragging her nails along the skin. Turns out she’s using a plastic cup, but like a pincer. “Cupping” stimulates the flow of blood, which draws toxins out of the body. I’m not sure whether it’s meant to be painful – after all, everyone’s pain threshold is different. All I can say is that, post-massage, I feel ready to take on the world. But the world can wait for an hour or so. First I beat a retreat to my stateroom, with its king-size Viking Explorer bed, and blob out with a movie on my widescreen TV (there are plenty of recent releases to choose from). I emerge in time for gin o’clock. Although I’ve enjoyed the relative emptiness of the ship, even when the coachloads return from Rome the atmosphere doesn’t suffer. Thanks to a generous passenger-space ratio, Viking’s ships never feel crowded and, with their Scandi-style decorative theme of light wood, clean lines and woven textiles, the ambience is always serene. Everywhere you look, too, there are nods to the Hagen family and their Scandinavian heritage. One of the most delightful is the daily “Munch Moment”, which takes place in the Atrium at 6pm. And it’s not what you think. Rather than yet another excuse to polish off more snacks and pastries, this is a tribute to Norway’s most famous artist. For 45 minutes guests are treated to a performance of live classical music, while the expressionist paintings of Edvard Munch rotate on a big screen at the top of the stairs. If all that culture gives you an appetite, Viking Sky offers numerous dinner options, and the good news is that none involves a surcharge. The even better news is that the food is quite superb. The buffet-style World Café serves up something for every palate, and the Restaurant provides a mix of à la carte regional specialities and familiar American classics. 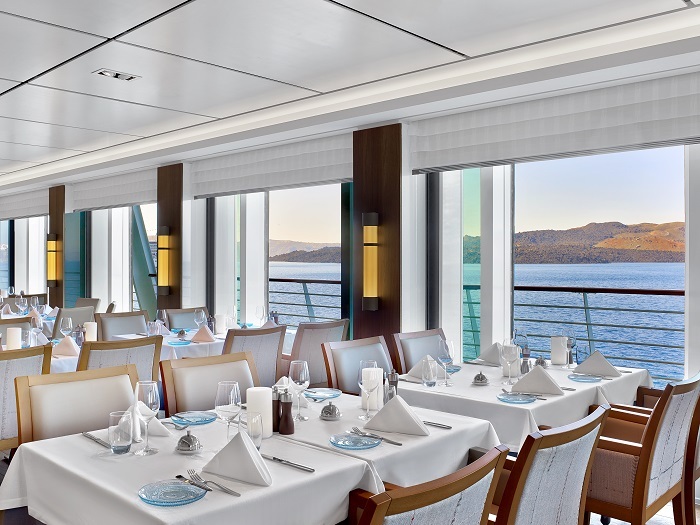 Reservations are advised for the Chef’s Table, which delivers an interactive dining experience, pairing a tasting menu with wine, and also for Italian-themed Manfredi’s, which is named after Torstein Hagen’s great buddy, the chairman of small-ship cruise line Silversea. By the time I have worked my way through a plate of Manfredi’s fried calamari, and then a thick-cut ribeye coated in garlic oil and rubbed with porcini mushroom powder, brown sugar and red chilli flakes – this being the house special – I’m seriously wondering how I’ll manage pudding. But in the interests of research I dig deep, and I can report that Nutella panna cotta is every bit as dreamy as it sounds. Speaking of which, when I finally flop into bed (after a nightcap in sociable late-night venue Torshavn), I sleep the sleep of the just. So yes, maybe those Scandinavians adopt a few extreme habits to find inner peace, but when these are balanced with some simple pleasures, I’d say the Vikings’ descendants have their approach to life spot-on. Viking Sky will be sailing in Scandinavia throughout this summer. Into the Midnight Sun, 15 days, London to Bergen via Edinburgh, the Shetland and Orkney islands and the Norwegian fjords, price from £4,490. 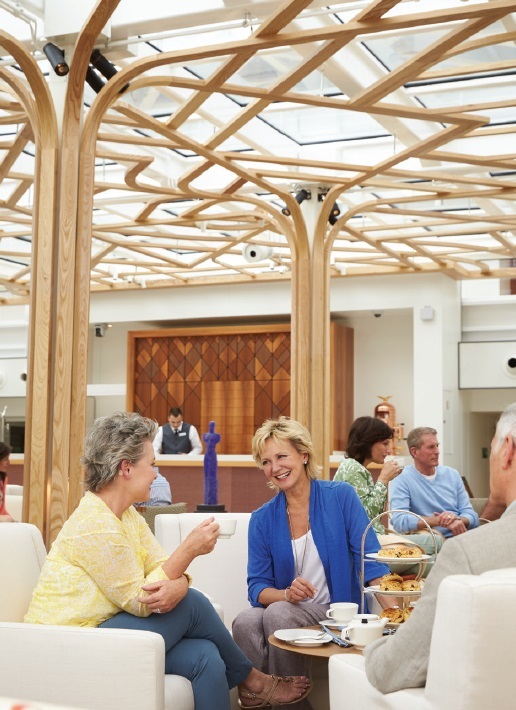 See vikingcruises.co.uk or call 0800 458 6900.